"All he really wanted out of life was love. That's Charlie's story. That's how he lost it." With its current position atop AFI's list of 100 best movies ever made (and #38 on IMDb), I suppose there are two separate ways in which we should explore 'Citizen Kane.' First, let's discuss the film as a narrative. No history. No context. Just as a story imprinted on black and white celluloid. What's it about and does it still work? The first question is easy. 'Citizen Kane' is the story of Charles Foster Kane. It's a non-linear biography of a fictional newspaper baron who had an insatiable appetite for everything -- melodramatic storytelling, collecting fine art, women, fame, and political might. But instead of the typical structure where we meet our hero, watch him rise, and watch him fall (or possibly succeed), 'Citizen Kane' explores this Great American, not through his own stories but, through the eyes of those he knew. In varying perspectives, we get an intriguing look at a bold man who, after being taken away from his parents at a young age, wanted nothing more in life than to find love. He tries being the champion of the people by running a yellow journalism newspaper. He tries marriage. He even tries politics. But it all comes crumbling down. It's an odd film because of the Rashomon-style way we approach everything. The film starts with Kane's lonely death in the form of a news reel. The reporters don't think they have the perfect story yet, so they go about investigating Kane's last word, "Rosebud." The film then branches out as the intrepid reporter interviews Kane's associates and ex-wife. We jump backwards and forwards in time, looking at scenes from one perspective, and finishing them in another, and then going back again. And did I mention there's also a musical number? It's an engaging way to look at a man, who by modern standards, shouldn't be likeable. Why would a regular joe care about the sixth richest man in the entire world? That's fair, but I think this is one of those film structures where the point isn't to see what it would be like for you to be that person. Think of the film as a structural cousin to something like 'Forrest Gump'. This isn't a movie where a man learns and then changes over a traditional arc. This is about a man who changes the world around him and because he is unwilling to learn (to change), pays the price of absolute solitude. This movie explores what it means to be Great, good and bad. In those terms, I've always found 'Citizen Kane' to be a damn fine drama. I wanted to unearth the secret behind Rosebud. I wanted Kane to stand for the average working American against corrupt special interests. I wanted him to prove the world that his wife could sing. But Kane's problem is that he'll fight to the death without first calculating whether or not he can win. In one hand, he doesn't care what others think, and in the other, he's tormented by opinions and perceived embarrassment. The saddest part of it all is that Kane never really understands people. He wants to. But he doesn't. All he ever had was the money. "If I hadn't been rich, I might have been a really great man." However, the film isn't perfect. There are some slow parts, and while Rosebud's final reveal is fitting, it's a little underwhelming next to the great things we've seen this man do. Generally, though, 'Citizen Kane,' filled with some whiz-bang camera work and a collection of fine performances that, while dated in terms of the style of acting, still holds up today. Director/star Orson Welles is a huge personality and plays the titular character as if he were one of Shakespeare's greatest creations. It's amazing how serious the film can be at times, with slapstick comedy following (as well as the aforementioned musical number). 'Citizen Kane', in my humble opinion, still works quite well and remains as standout in terms of its gorgeous visuals, ambitious scope, dynamic lead character, and engaging structure. With that chunk of the review aside, we'll take a quick gander at 'Citizen Kane' from a historical and influential perspective. This, depending on your personal opinions, may be more important than what we've already covered above. There's a lot we could discuss. Orson Welles was a 24-year-old wunderkind when he signed an unprecedented deal with RKO pictures in 1939. It provided the young auteur total control, and he had never made a film before! Welles, through making this picture, would then go head to head with a media titan by the name of William Randolph Hearst (who most agree is the inspiration for Kane), and in many ways never recovered. Welles' career battles would, strangely, mimic the trajectory of Charles Foster Kane's. Then there's the cinematography, which Roger Ebert has said inspired the look of Film Noir (like 'The Maltese Falcon') for the next two decades. You know how Steven Spielberg likes to backlight everything with long beams of light? Look no further than this movie for that influence (there's even an homage to Kane's opening title sequence in 'Duel':here at 1:40). 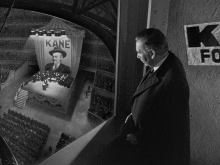 Citizen Kane' also features a large number of almost-modern visual effects (matte paintings and compositing) used to expand a film mostly shot on stages. Or, perhaps you recall the wonderful swooping over buildings camera work in Alex Proyas' 'The Crow', because that's here too. There's also a number of influential, montage sequences, which clearly laid the ground for 'Rocky' and every 80s-movie montage. And don't get me started on the gorgeous, Deep Focus cinematography. There's really too much to mention, but we have to remember that Orson Welles was a first time director, having been a huge hit in radio and theater. 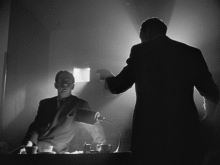 Welles, with the help of cinematographer Gregg Toland, wasn't bound by any of The Rules because he didn't know any. 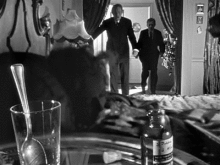 Welles and company created a truly modern cinematic language. Today still, the film remains visually astonishing in nearly every frame, from the staging, to the long and continuous shots, and even the transitions. Everything is so well done. Even if you don't like this movie in a dramatic sense, every film lover (and especially those interested in a career in film) needs to see and study this movie. There's so much to learn; so much you'll notice after each viewing. In the end, 'Citizen Kane' is the definition of a Masterpiece, with its story, style, influences, and controversies adding to a larger mythology than any one of those elements would provide alone. Kane, like its director and the man who tried to destroy it, is larger than life and I for one think we're lucky to still have it some 70 years later. The 70th Anniversary of 'Citizen Kane' is available in the Ultimate Collector's Edition (reviewed here), an Amazon Exclusive variant which also includes a DVD copy of 'The Magnificent Ambersons,' as well as this two-disc edition (sans the swag) housed inside Digibook packaging that was previously a Best Buy exclusive. 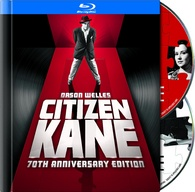 Like the other releases, the first disc is a BD-50 Blu-ray with 'Citizen Kane' and its standard-definition supplements, the majority of which were ported over from the DVD release. The other disc is a DVD with 'The Battle Over Citizen Kane' -- the 1995 Oscar nominee for Best Documentary feature. However, the third disc with 'RKO 281' (the 1999 HBO movie about the making of 'Citizen Kane') is not included in this set. Both discs are included inside a hardbound book with 48 pages of film history, photos, and more. The Blu-ray is reported to be region free. 'Citizen Kane' comes to Blu-ray with a brand new 4K digital restoration. Framed in its original theatrical aspect ratio of 1.37:1, with an 1080p/AVC MPEG-4 encoding, 'Citizen Kane' isn't perfect, but it's pretty darn close. I'm sure most people, after seeing the DVD, are concerned that the movie's been completely scrubbed of grain. What I'm here to say is that the grain lives and this BD looks like FILM. It's really amazing. I initially thought it wasn't much of an improvement over the DVD, but then I started going back and forth, and the Blu-ray's the clear winner. Detail is everywhere, from the texture of sets and actors. This Blu-ray really benefits from the Deep Focus photography techniques. The blacks are sharp and could be a little darker, but there's such a dynamic contrast range here. The gradation from light to dark is perfect, with no signs of banding. You can see deep into some shadows, picking up things you've never seen before. In terms of negatives, while there aren't any scratches (other than the intentionally distressed newsreel footage), there are some odd, what look like chemical, blemishes that appear from time to time. I noticed them early on waffling around the right hand side of the frame. I did also notice some minor haloing around some of the actor's heads; this could be some minor edge enhancement, or something dealing with the production itself. I'm not exactly sure, but it's not a tiny blemish, and I'm really nitpicking here. 'Citizen Kane' on Blu-ray looks better than most of the prints I've seen in 35mm. Thank you, Warner Bros, for treating your classics with such respect. Warner has chosen to forgo any expansion into multi-channel surround sound. What we have here is an authentic, lossless 1.0 DTS-HD MA track. And while it's obvious that 'Citizen Kane' will never be able to technically compete with modern audio, it sounds pretty great. There is no hissing or popping to be found. Dialog is warm and well balanced; check out a number of scenes featuring whispers to hear the fidelity. Thanks to the new encoding, Bernard Herman's score gets some room to breathe in a way I've never quite heard before. There's no LFE to be found, but given the origins and technical limitations of this 70-year-old soundtrack, this is the best I've heard it. The lack of compression really fills out the audio experience. What I generally do for older, mono films is run the audio through my full range front tower speakers, rather than my smaller center channel, and listening to this Blu-ray is like seeing a brand new print, probably even better as those tend to have some pop and crackle, in a repertory cinema. All of the Blu-ray editions of 'Citizen Kane' carry over the supplements from the 2001 DVD release. While it would have been nice to see some new features created specifically for these anniversary editions, there's still a lot of great stuff here nonetheless. Two Feature Commentaries -- One with Roger Ebert and the other with Peter Bogdanovich. Both here are from the previous release, but remain fascinating listens. Bogodanovich famously spent time with Welles and Ebert's love for film, especially this one, is infectious. Listening to this again while writing my review, it saddens me to know there won't ever be a new Ebert commentary. Opening World Premiere for 'Citizen Kane' (SD, 1 min) -- Footage from the premier. Interviews (SD, 9 mins) -- There are two: Ruth Warrick, the first Mrs. Kane, talks for a few minutes about her experiences making the film. And Robert Wise, though he would go on to direct classics like 'The Sound of Music' and 'West Side Story', talks about his time as Editor on the film. Both interviews were recorded in 1997. Warrick's interview was on the DVD, but the Wise addition may be new (or have been an Easter egg). Production (SD, 15 mins) -- There are three featurettes here, which can be played as one, or individually. They include storyboards, call sheets, and still photographs from the film. The photographs include portions of Roger Ebert's commentary. Post-Production (SD, 5 mins) -- Here, there are Deleted Scenes (comprised of still photographs and storyboards), Ad Campaign materials, a few pages of the Press Book, and Opening Night footage. My favorite thing here was a letter written about the film's demographics; it seems studios have always been concerned with audience test screenings. Theatrical Trailer (SD, 4 mins) -- This is a fantastic teaser trailer that I assume most fans have seen, but it's always great to revisit this. Because Welles was famous for radio, he created a truly unique trailer, comprised of Welles' off camera voice talking into a microphone, introducing the film's actors and characters. Really, really fun. 'The Battle Over Citizen Kane' (SD, 113 mins) -- Award Best Documentary Feature in 1995, this is an oldie, but a goodie. An enthralling look into the battle of two powerful men, and why the world almost never got a chance to see 'Citizen Kane'. It's not new, but remains a must watch every once in a while. Note that this edition does not include the third disc with 'RKO 281' on DVD or any of the collectible reproductions (such as the ten studio memos, five one-sheet posters, and 20-page souvenir program) found in the Ultimate Editions. Now over 70 years old, 'Citizen Kane' has certainly aged gracefully and still stands tall as a marvelous and historic cinematic achievement that many hail as the greatest movie of all-time. Orson Welles' timeless masterpiece has also never looked or sounded better than it does on Blu-ray, as Warner's 4k restoration treatment of the 1941 classic is simply phenomenal and the lossless mono soundtrack will surely please every fan of the film. And while this former Best Buy exclusive digibook release does lack the third disc (with 'RKO 281') and the collectible reproductions found in the 'Ultimate Editions,' it's a pretty sweet alternative for those who dislike clunky box set packaging.